Hi friends! 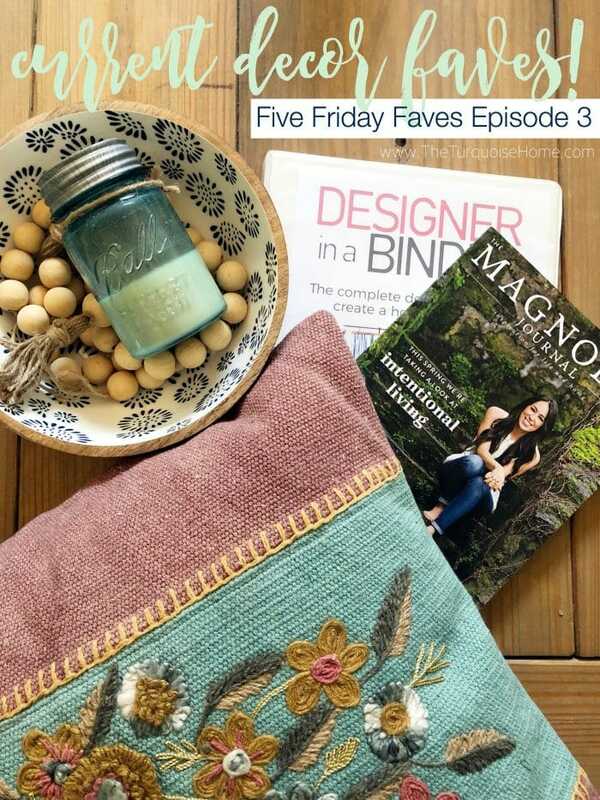 I’m happy to be back for another episode of Five Friday Faves! I don’t know if you’ve loved the last two episodes on planner faves and my favorite Christmas presents, but either way, I know you’re going to love this one! I’m sharing all about the design and decor things I’m loving this week. It was a fun episode to shoot and I think it will be helpful and hopefully fun for you, too! I didn’t re-record it because I didn’t have time and I kind of want to have these first videos to see how terrible I was. LOL I hope to improve as I do more, so thank you for sticking in there with me as I figure out this whole video medium. This post contains affiliate links for your convenience. See my full disclosure policy here. 1. Designer in a Binder. Y’all I am so stoked about this design guide that is coming out in just a week and a half. It is so concise (no fluff) and Tasha walks you through every step you need to take to conquer every space in your home. It’s just so good! I do so much better when I have a plan. It also keeps the information about all of your rooms in one place, so if you need it when you’re out shopping for furniture or home decor, you have everything you need right there! You will LOVE it! 2. Magnolia Journal. I don’t have time to read every magazine that darkens my door because I’m just too busy. But you better believe I make the time to read this magazine from cover to cover! It has great decor and entertaining ideas, but most of all it has heart. I love how it has a page of a pretty quote on it. Or a whole section talking to real people about living intentionally. 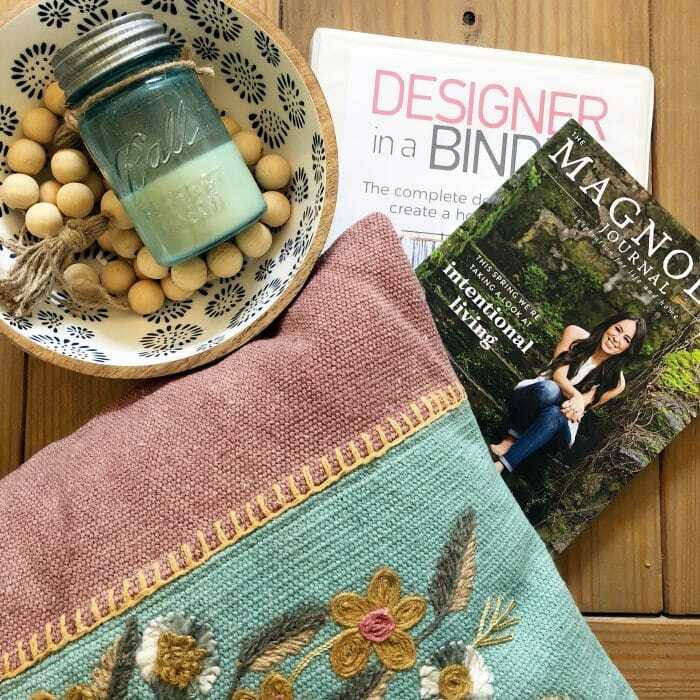 It’s so much more than a home decor magazine, which would be enough. I just love it and if you only get one magazine, this would be it! 3. Antique Candle Co. I am a diffuser and essential oils girl all the way, and a couple of years ago I got rid of nearly all of my candles. And any candles you see in my decor are for just that – decor. But then I discovered these candles and I’ve become obsessed! The fun thing is that they have periodic sales with antique blue mason jar candles. I LOVE them! And they act as decor as well as they smell delicious. I love these scents the most: Christmas Day, Autumn Leaves and Clean Cotton. I have Southern Hospitality as well, but it’s a smidge florally for me. I still like it, though! And if you love floral scents then you will LOVE it! I also love that they are a small business that uses domestically grown soy beans to make their wax. Their candles only contain soy wax, fine fragrances and cotton wicks. So, if there was a quality candle to buy out there, this one is it! I just love their business. Oh, and they ship the candles out same day and they get here super fast (maybe 2 days!). 4. Blush Garden Floral Throw Pillow. It was time for some new colorful pillows in the living room for spring. And I fell in love with these embroidered pillows! I can’t wait to share them in my living room spring decorating posts! 5. Round Mango Wood Serving Bowl. I saw this online a few weeks ago and then went and saw it in the store. I adore the combo of the wood, white and navy. It’s so pretty in person and will look great filled with fruit for spring! Thank you for joining me for week 3 of Five Friday Faves! I’ll be back next week with more goodies! I find some of your things interesting but I weary of it being about selling things. I guess I just need to stop following you if that bothers me. Your home is cute and I love your smile. I just wish the format you use was different. Hey Laura! I recently moved back to my home town of Giddings near Round Top after being gone for 30 years! & went to the Round Top/Warrenton Antique show for the 1st time last fall. We started in Warrenton & didn’t even make it to Round Top. The show is HUGE & AWESOME! You could shop there for a week & not see everything. My sister & I plan on going back for the spring show so come on down! Would love to meet you! There is also the Bluebonnet Festival in Chappell Hill TX April 14-15 that is so much fun & grows every year!